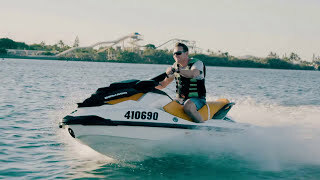 Jet Ski Safaris offer the most unique, specialised and exciting experience on the Gold Coast, voted number one by the public! Ride your own jet ski and feel the freedom and exhilaration that Jet Ski Safaris has to offer as you explore the wild blue yonder and the hidden islands of paradise. Meet the local dolphins, turtles, wallabies and wild pigs that inhabit this wonderful Jet Ski paradise. Stop off at a tropical Island resort on South Stradbroke Island, where you can have a splash, something delicious to eat and a nice cold beverage. With big hairpin bends, narrow tidal passages, miles of untamed mangroves and Aussie flora and fauna around every turn, it's a ride that you'll never forget! With the largest fleet of Jet Skis in Australia, they can cater for all group sizes, ranging from 1 to 40 guests. All Safaris are lead by knowledgeable guides for the purpose of safety and navigation. With multiple guides per trip, you set the pace and can travel at whatever speed you desire, whether that is leisurely, medium or superman fast. The half hour Safari will blast you along pristine beaches, Wave Break Island, through Crab Island, south of Sovereign Island and back down along the sandy shores of South Stradbroke Island. This is a short and sweet safari which gives you good taste of Jet Ski adventure and a brief look at the beautiful waterways. The one hour Safari is approximately a 30 kilometre round trip. Non Stop Fun! Get ready for a one hour South Stradbroke Island adventure thrill of a lifetime! Blast your way along the sub tropical shores of South Stradbroke Island. Head North for a good 15 kilometres weaving your way past beautiful Islands, beaches, sandbars and mangroves before turning around and making your way back home. This Safari is one and a half hours of jet skiing. Experience the exhilaration and freedom that Jet Ski Safaris offer as you skim over the pristine waters along the wonderful sandy beaches of South Stradbroke Island. Head north for 20 kilometres where you disembark at the half way destination point, the wonderful Tipplers Tropical Island Bar. Here you can enjoy refreshments, meet the local wallabies and enjoy the beautiful island scenery before making your way back home. A unique and exciting adventure activity on the Gold Coast! It doesn't get better than this as you escape into paradise, veering off the beaten track. Follow the narrow tidal passages that whip and snake their way through miles of mangroves and flood plains. Stop into South Stradbroke Island at a tropical bar. With hairpin bends, and flora and fauna around every turn, this is a ride that you'll never forget.